The index opened up above the psychological level of 8500 and saw huge buying interest to cross 8600 in the process but closed just below at 8588.25, huge gain of 94.05 points. The broader market though was weak, with 746 advances to 793 declines. Tentative Range at the start of series comes to 8300-8800. Call option 8600-9000 added huge 39.75 lacs OI with short covering seen at 8500 and below strike prices. Put option 8800-8300 added huge 45.87 lacs OI with profit booking seen at 8200 and below strike prices. 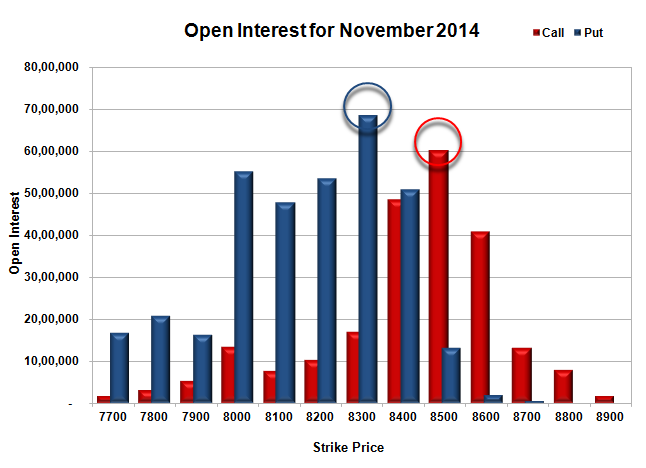 Nifty Open Interest is at 2,22,16,425 up by 12,75,575, with huge increase in price, probably huge long build-up. Bank Nifty Open Interest is at 17,39,125 up by 1,76,900, with huge increase in price, probably huge long build-up. FII’s bought huge 19.33 lacs Futures, which includes 65417 contracts long build-up and 11920 contracts short covering, with increase in net OI by 53497 contracts (includes 133831 longs to 56494 shorts for the day) and the Average Price comes to 8730.17. 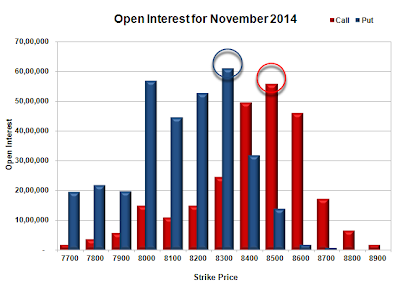 FII’s Index future open contract as on date is 730220 Longs to 50288 Shorts, net long 679932 up by 77337 contracts. 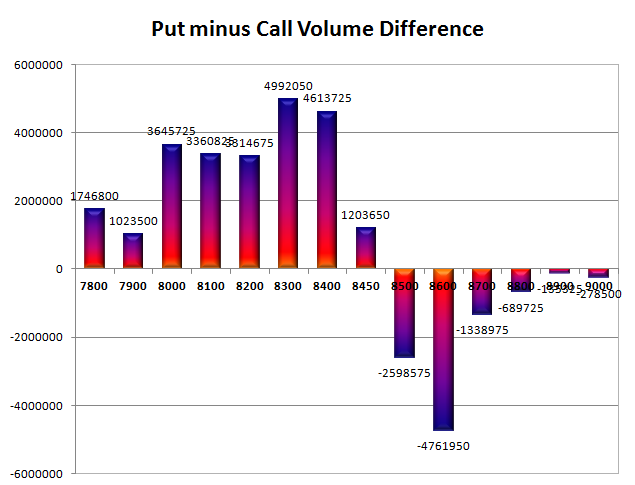 Initial and best support at 8500, with OI of 42.07 lacs and below that at 8400 with OI of 37.31 lacs. 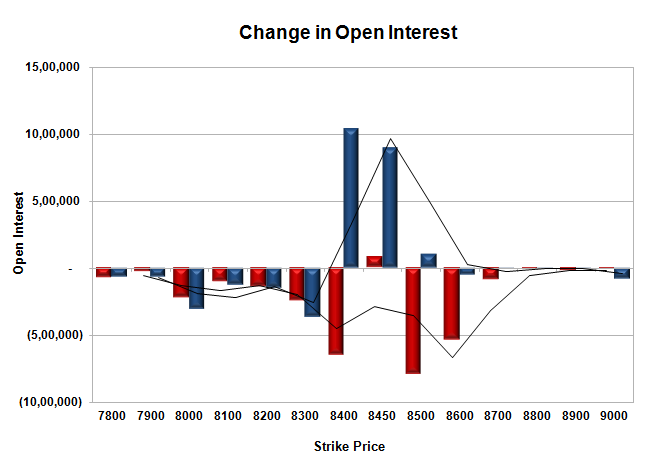 Initial resistance at 8600, with OI of 39.88 lacs and above that at 8700 with OI of 37.96 lacs. Day Range as per Option Table is 8521 - 8636 and as per VIX is 8530 - 8646 with 8574 as the Pivot. The index opened flat to negative and stayed weak for the better part of the morning session only to the see the buyers back around noon to move the index back in green making a high of 8500 but closed just lower at 8475.75, gain of 12.65 points. The broader market was also strong, with 928 advances to 574 declines. Tentative Range for Expiry comes around 8400-8550. Call option 8450 added 0.78 lacs OI with short covering seen at 8400 and below strike prices. Put option 8500-8400 added huge 20.36 lacs OI with profit booking seen at 8300 and below strike prices. Nifty Open Interest is at 94,16,575 down by 36,29,925, whereas Dec series added 44.96 lacs, with small increase in price, 100% roll-over with long build-up. Bank Nifty Open Interest is at 13,81,625 down by 1,17,850, whereas Dec series added 1.94 lacs, with decrease in price, 100% roll-over with short build-up. FII’s bought 1.26 lacs Futures, which includes 32639 contracts long build-up and 27610 contracts short build-up, with increase in net OI by 60249 contracts (includes 241587 longs to 236558 shorts for the day) and the Average Price comes to 8633.20. 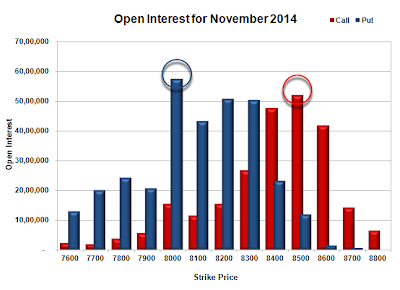 FII’s Index future open contract as on date is 765983 Longs to 206047 Shorts, net long 559936 up by 5029 contracts. 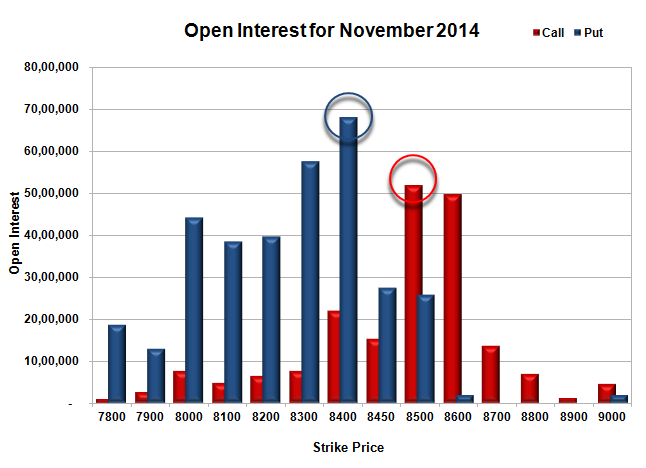 Initial and best support at 8400, with highest OI of 68.09 lacs and below that at 8300 with huge OI of 57.61 lacs. 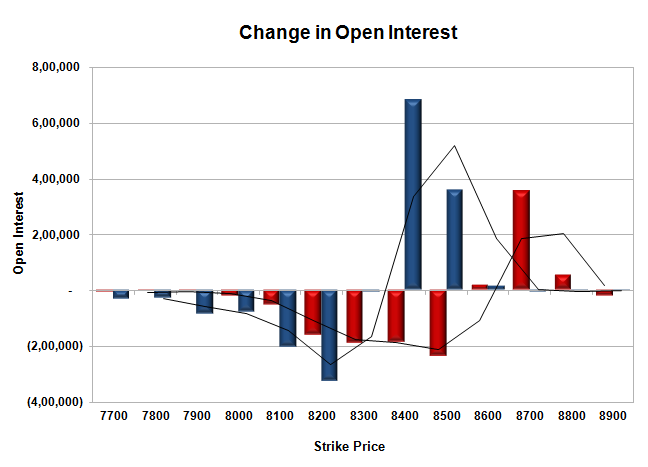 Initial and best resistance at 8500, with huge OI of 51.97 lacs and above that at 8600 with OI of 49.73 lacs. 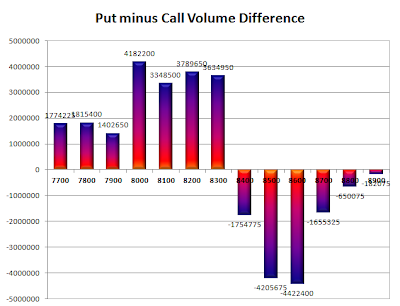 Day Range as per Option Table is 8419 - 8527 and as per VIX is 8418 - 8533 with 8472 as the Pivot. The index opened flat but saw huge selling pressure from the onset to move lower with each passing hour and making a low at 8429. Small buying towards the dying minutes saw the index close a bit higher from the lows at 8463.10, huge loss of 67.05 points. The broader market was also very weak, with just 298 advances to 1263 declines. Tentative Range till Expiry comes around 8350-8550. Call option 8450-8700 added huge 34.99 lacs OI with short covering seen at 8400 and below strike prices. 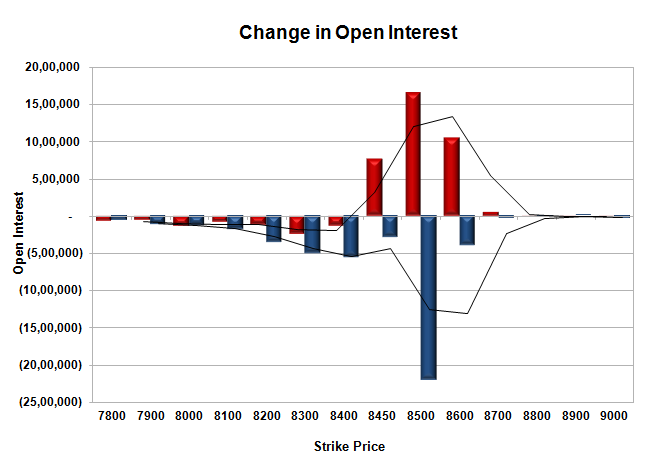 No Put option saw any OI addition with huge short covering seen at 8500 and above strike prices. Nifty Open Interest is at 1,30,46,500 down by 58,59,675, whereas Dec series added 56.88 lacs, with decrease in price, mostly roll-over with small long liquidation. Bank Nifty Open Interest is at 14,99,475 down by 4,02,425, whereas Dec series added 1.85 lacs, with decrease in price, small roll-over with huge long liquidation. 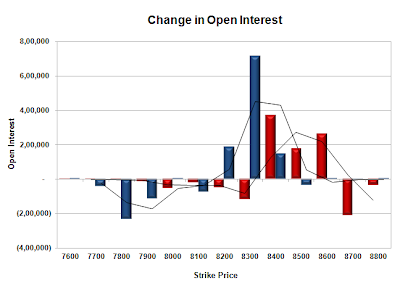 FII’s sold 6.43 lacs Futures, which includes 4765 contracts long liquidation and 20956 contracts short build-up, with increase in net OI by 16191 contracts (includes 342380 longs to 368101 shorts for the day) and the Average Price comes to 8571.27. 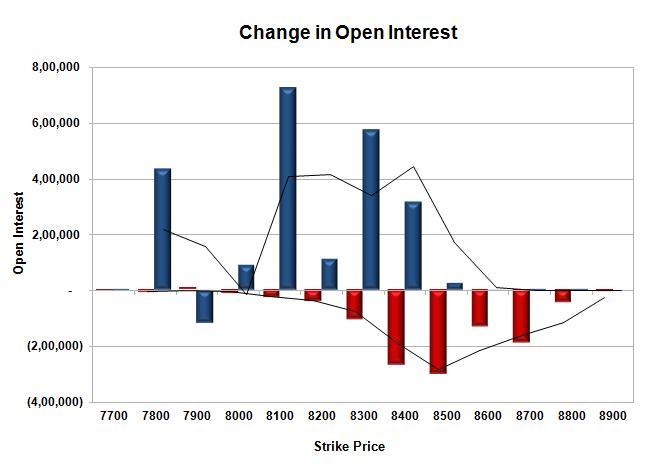 FII’s Index future open contract as on date is 733344 Longs to 178437 Shorts, net long 554907 down by 25721 contracts. 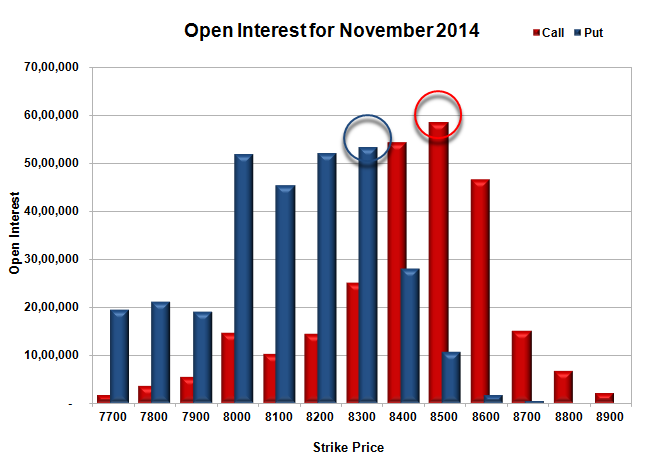 Initial support still at 8400, with huge OI of 57.74 lacs and below that at 8300 with highest OI of 61.30 lacs. 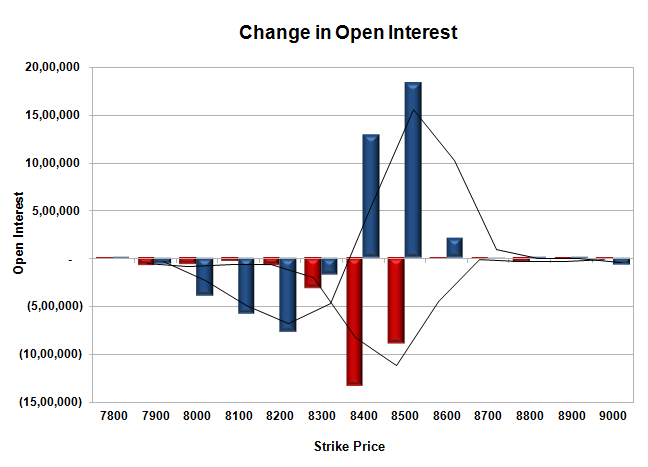 Initial and best resistance at 8500, with huge OI of 59.87 lacs and above that at 8600 with OI of 55.11 lacs. 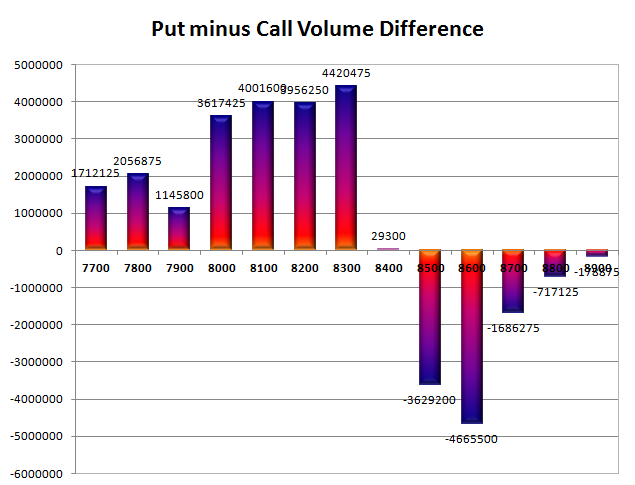 Day Range as per Option Table is 8417 - 8529 and as per VIX is 8403 - 8523 with 8476 as the Pivot. The index opened flat to positive but saw huge buying interest within the first few minutes of trade to move above 8450 and stayed strong making a high of 8490 but closed just lower at 8477.35, huge gain of 75.45 points. The broader market though was weak, with 652 advances to 889 declines. Tentative Range for the Expiry week is around 8350-8600. 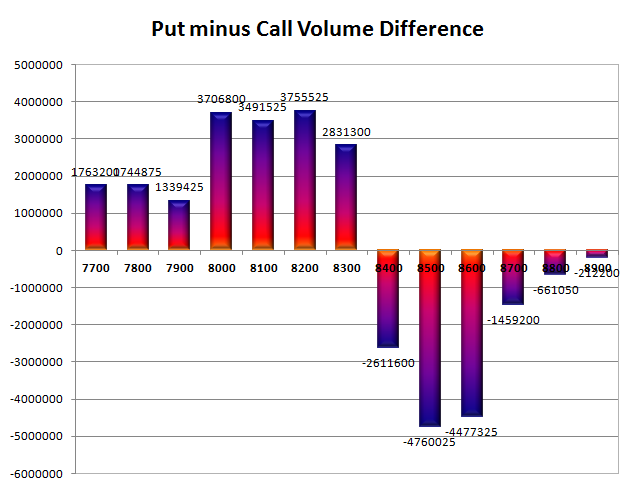 No Call option added OI whereas short covering was seen at 8500 and below strike prices. Put option 8600-8400 added huge 33.31 lacs OI with profit booking seen at 8300 and below strike prices. 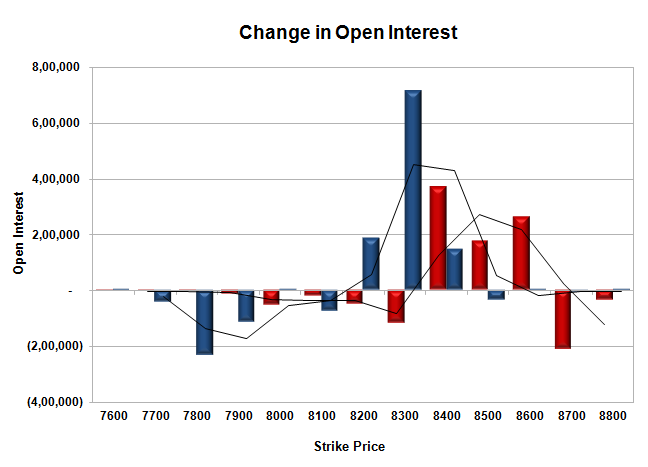 Nifty Open Interest is at 2,09,70,050 down by 4,48,725, whereas Dec series added 10.97 lacs, with increase in price, 100% roll-over with huge long build-up. Bank Nifty Open Interest is at 21,30,100 up by 94,000, whereas Dec series added 1.99 lacs, with huge increase in price, huge long addition in both series. FII’s bought 3.59 lacs Futures, which includes 15366 contracts long build-up and 990 contracts short build-up, with increase in net OI by 16356 contracts (includes 98733 longs to 84357 shorts for the day) and the Average Price comes to 8478.62. 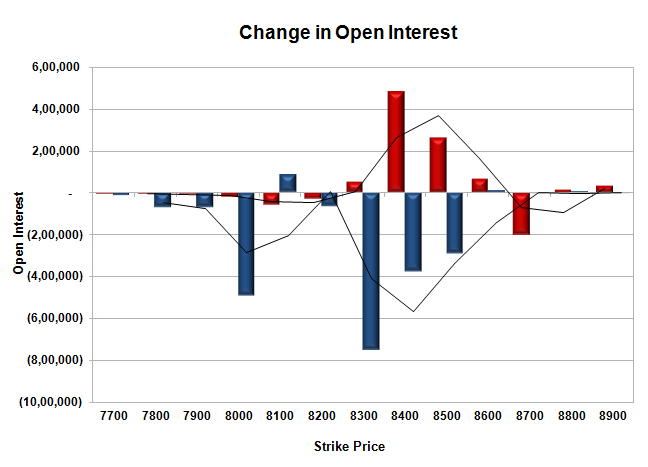 FII’s Index future open contract as on date is 735191 Longs to 153950 Shorts, net long 581241 up by 14376 contracts. 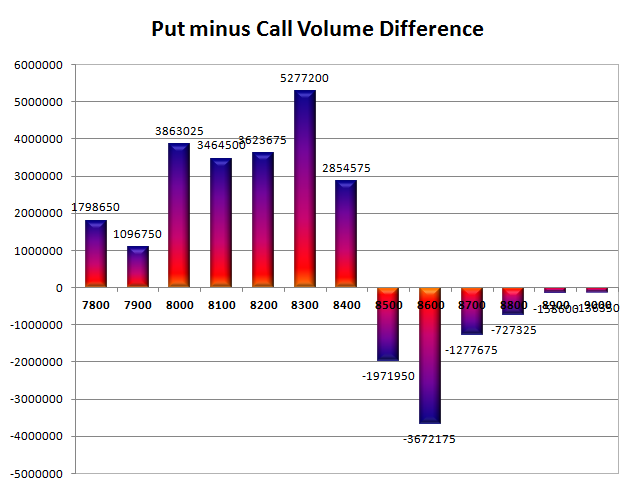 Initial and super support at 8400, with huge OI of 63.84 lacs and below that at 8300 with highest OI of 66.72 lacs. 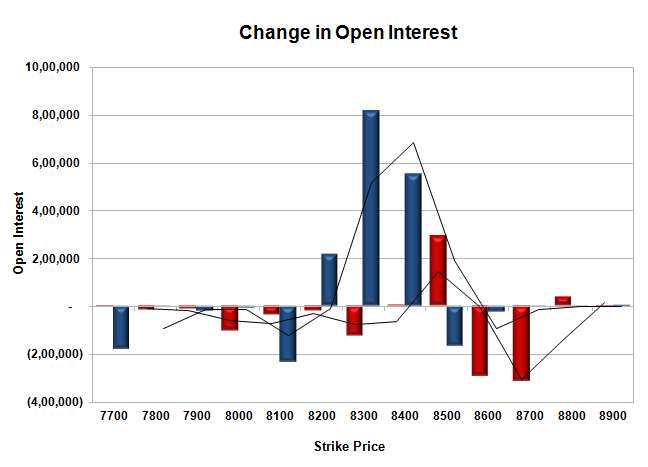 Initial and best resistance at 8500, with huge OI of 51.21 lacs. 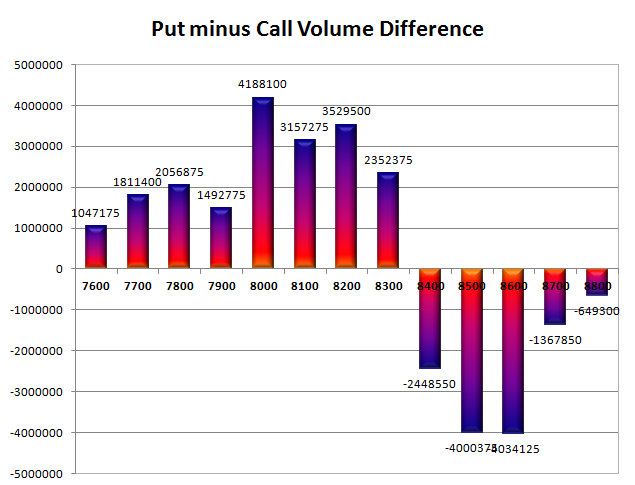 Day Range as per Option Table is 8404 - 8517 and as per VIX is 8416 - 8539 with 8455 as the Pivot. The index opened positive but saw profit booking to move to the lows of the day around 8353, from where the responsive buyers took control and moved the index back in green to close firm at 8401.90, small gain of 19.60 points. The broader market though was weak, with 564 advances to 970 declines. Tentative Range for the series is still around 8300-8500. 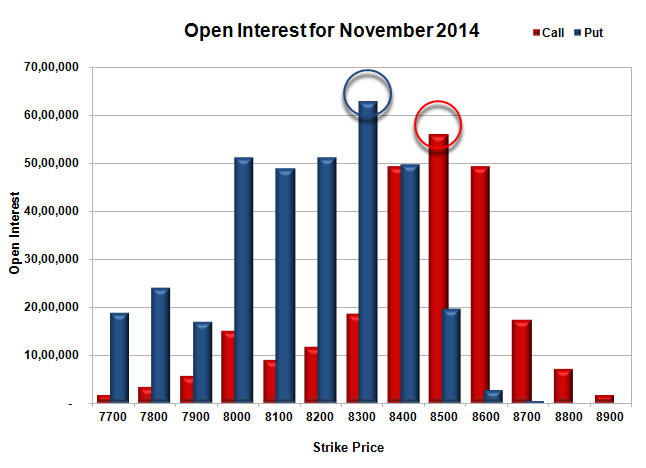 Call option 8500 added 2.93 lacs OI with profit booking seen at 8600 and above strike prices. Put option 8400-8200 added huge 15.89 lacs OI with profit booking seen at 8100 and below strike prices. Nifty Open Interest is at 2,14,18,775 down by 5,73,100, whereas Dec series added 4.24 lacs, with small increase in price, mostly roll-over with small short covering. Bank Nifty Open Interest is at 20,36,100 down by 48,750, whereas Dec series added 0.84 lacs, with increase in price, 100% roll-over with small long addition. 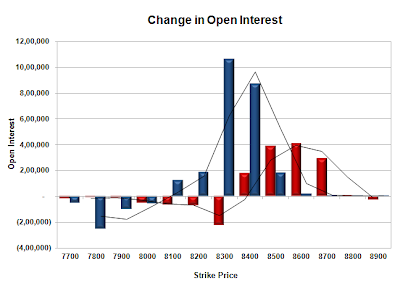 FII’s bought 2.25 lacs Futures, which includes 198 contracts long liquidation and 9186 contracts short covering, with decrease in net OI by 9186 contracts (includes 55942 longs to 46954 shorts for the day) and the Average Price comes to 8343.32. 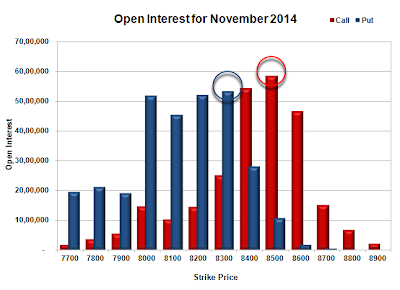 FII’s Index future open contract as on date is 719825 Longs to 152960 Shorts, net long 566865 up by 8988 contracts. Initial and best support at 8300, with highest OI of 68.50 lacs and below that at 8200 with OI of 53.51 lacs. 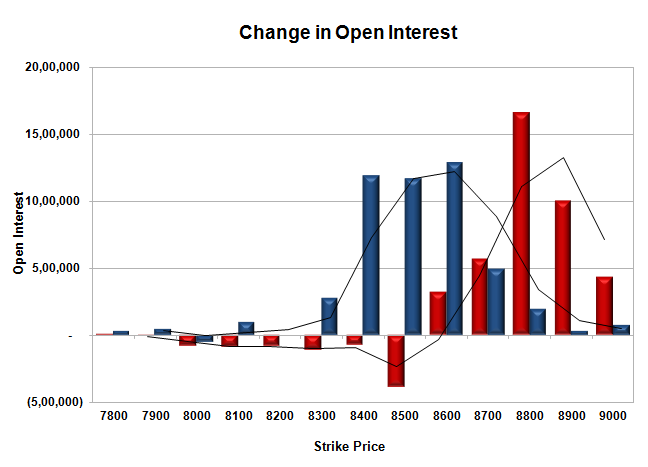 Initial and best resistance at 8500, with huge OI of 60.18 lacs and above that at 8600 with OI of 40.83 lacs. Day Range as per Option Table is 8335 - 8449 and as per VIX is 8340 - 8464 with 8389 as the Pivot. The index opened flat to positive but saw selling pressure from the morning itself to make lower lows with each passing hour. The dip buyers came back around 8360, but were unable to pull the index up by much and closed at 8382.30, loss of 43.60 points. The broader market was also weak, with 537 advances to 1019 declines. Tentative Range for the series is still around 8300-8500. 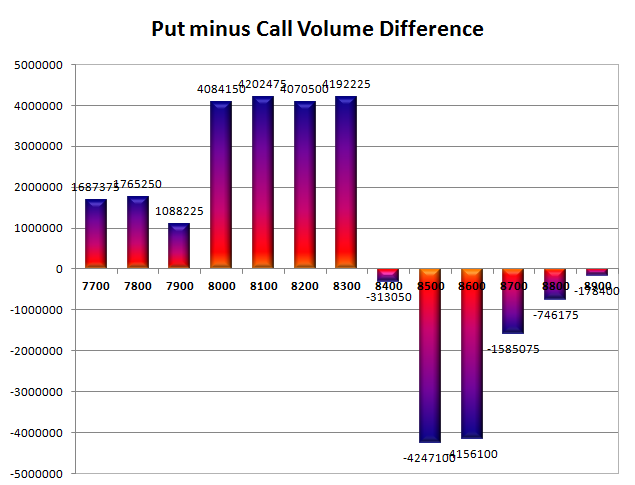 Call option 8500 added 1.26 lacs OI with profit booking seen at 8600 and above strike prices. 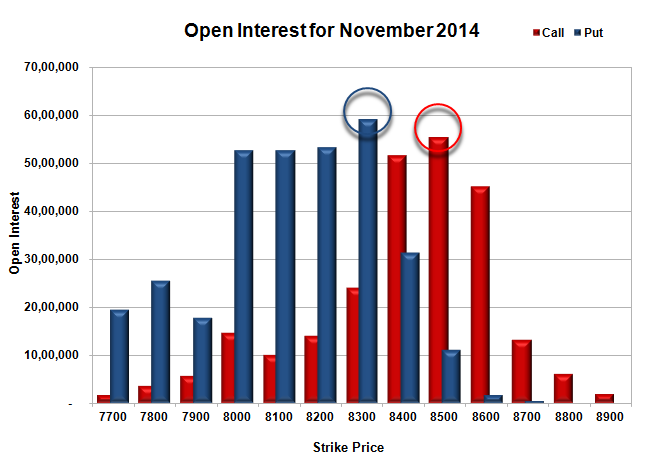 Put option 8100-8000 added huge 5.34 lacs OI with short covering seen at 8300 and above strike prices. Nifty Open Interest is at 2,19,91,875 down by 6,24,050, with decrease in price, probably long liquidation. 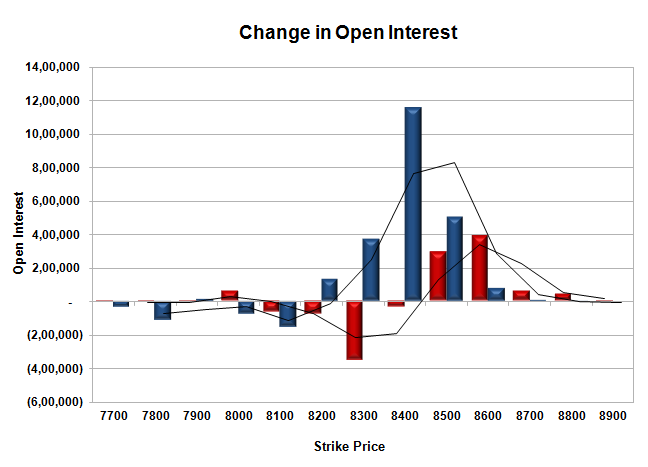 Bank Nifty Open Interest is at 20,84,850 down by 1,62,375, with decrease in price, probably long liquidation. FII’s bought 1.70 lacs Futures, which includes 1373 contracts long liquidation and 8157 contracts short covering, with decrease in net OI by 9530 contracts (includes 46482 longs to 39698 shorts for the day) and the Average Price comes to 8351.35. 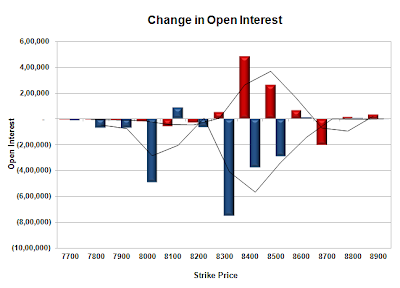 FII’s Index future open contract as on date is 720023 Longs to 162146 Shorts, net long 557877 up by 6784 contracts. 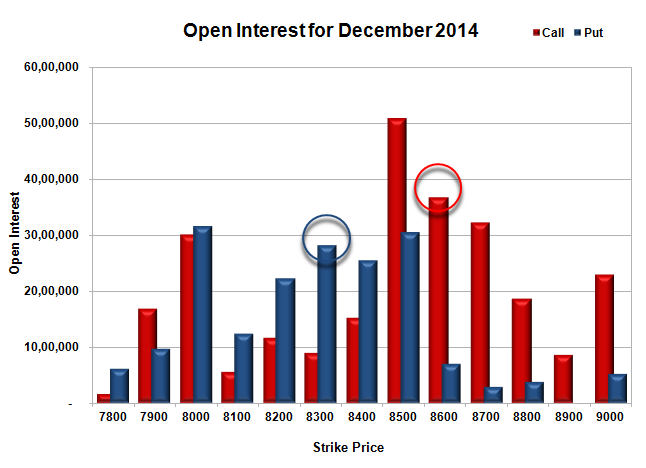 Initial and best support at 8300, with highest OI of 60.33 lacs and below that at 8200 with OI of 51.31 lacs. 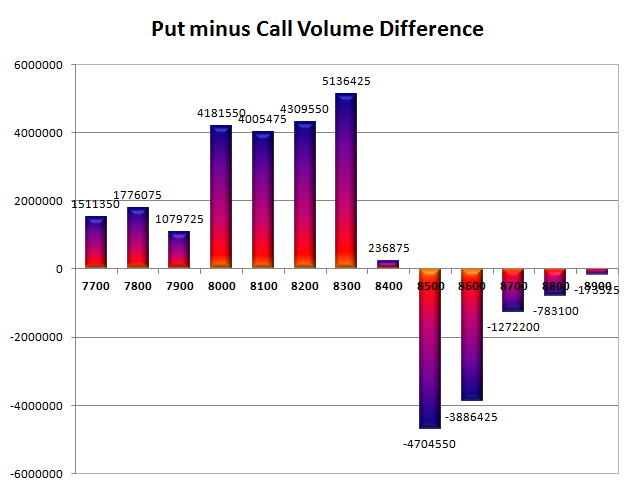 Initial resistance at 8400, with huge OI of 48.59 lacs and above that at 8500 with huge OI of 57.26 lacs. 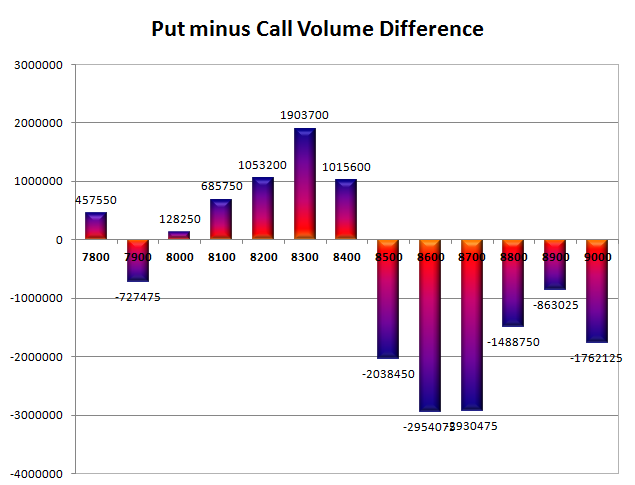 Day Range as per Option Table is 8337 - 8451 and as per VIX is 8319 - 8445 with 8399 as the Pivot. The index opened strong above 8400 but profit booking from the onset saw the index down to lows of the day around 8320. Some lower level buying saw the index close just below at 8357.85, small loss of 25.45 points. The broader market was also weak, with 590 advances to 956 declines. Tentative Range for the series is at 8200-8500. 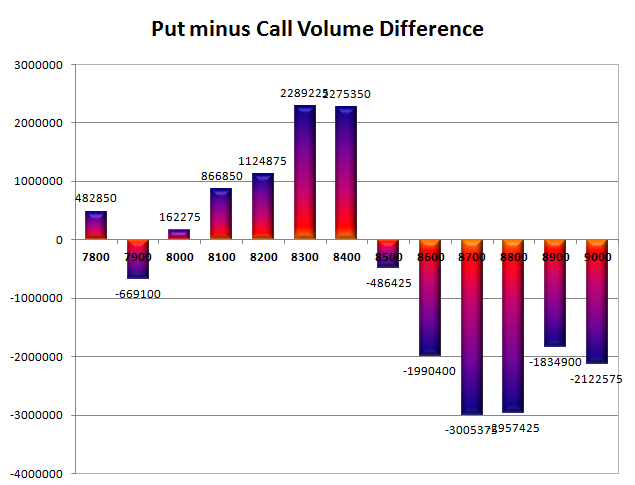 Call option 8300-8600 added huge 8.53 lacs OI with profit booking seen at 8700 and above strike prices. 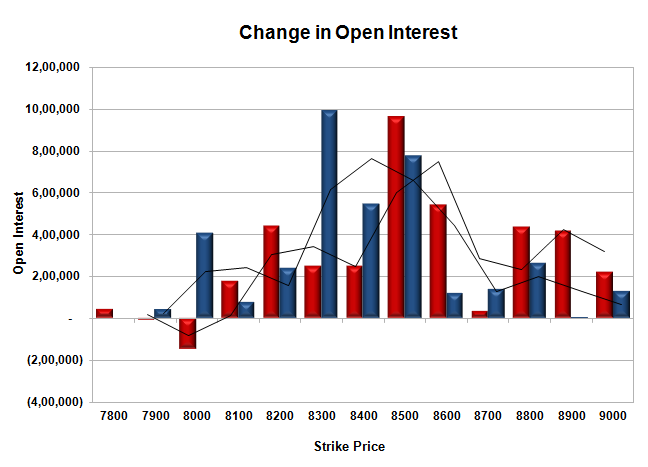 Put option 8100 added 0.85 lacs OI with short covering seen at 8400 and above strike prices. 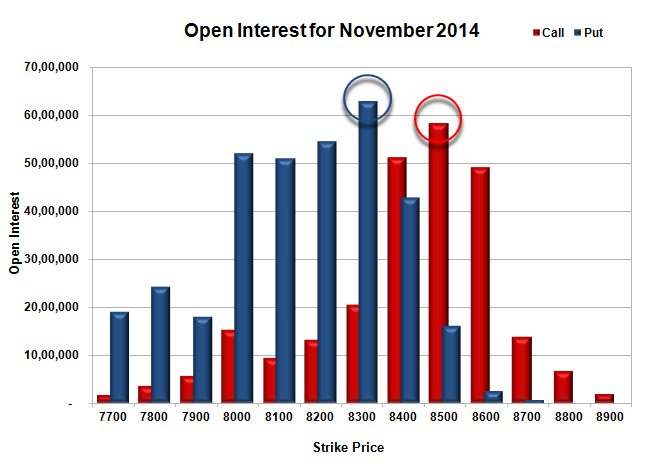 Nifty Open Interest is at 2,31,00,100 down by 6,73,250, with decrease in price, probably huge long liquidation. 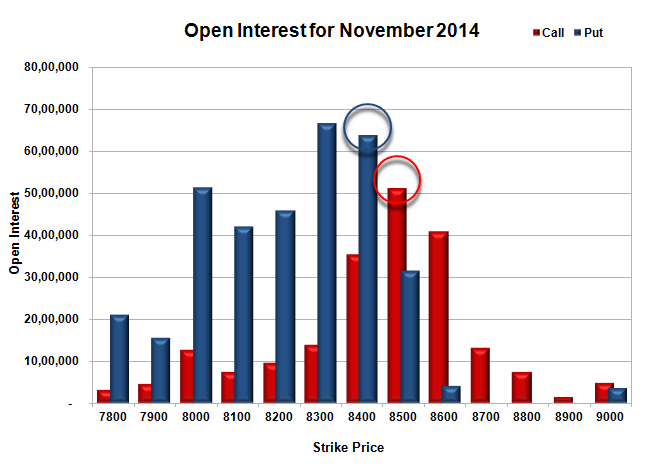 Bank Nifty Open Interest is at 20,46,400 down by 1,94,225, with decrease in price, probably huge long liquidation. FII’s sold 3.38 lacs Futures, which includes 11689 contracts long liquidation and 1828 contracts short build-up, with decrease in net OI by 9861 contracts (includes 54728 longs to 68245 shorts for the day) and the Average Price comes to 8299.33. 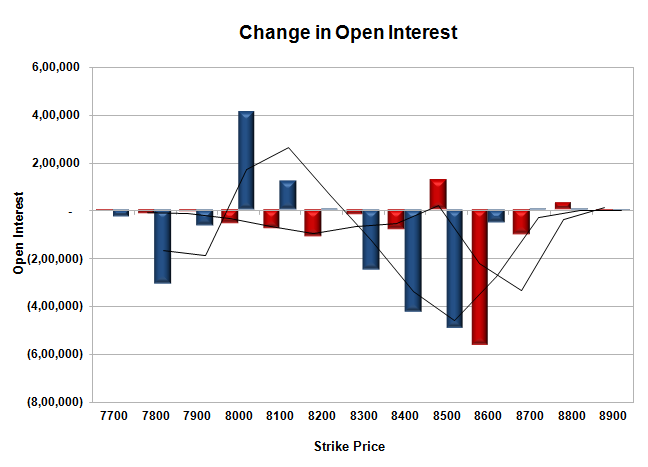 FII’s Index future open contract as on date is 735805 Longs to 151292 Shorts, net long 584513 down by 13517 contracts. 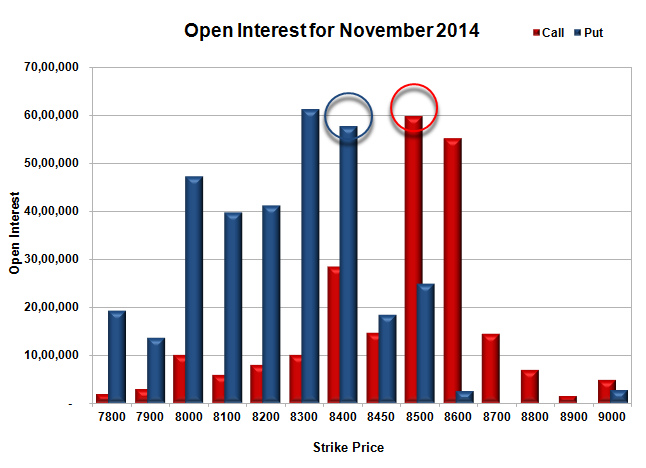 Initial and best support still at 8300, with huge OI of 53.40 lacs and below that at 8200 with OI of 52.09 lacs. 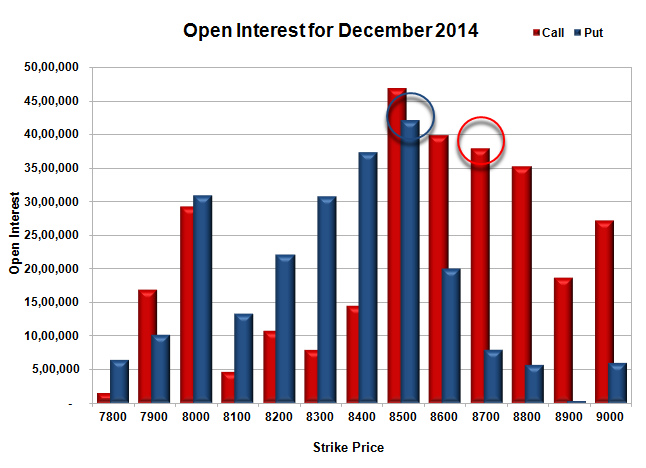 Initial resistance at 8400, with huge OI of 54.25 lacs and above that at 8500 with highest OI of 58.45 lacs. 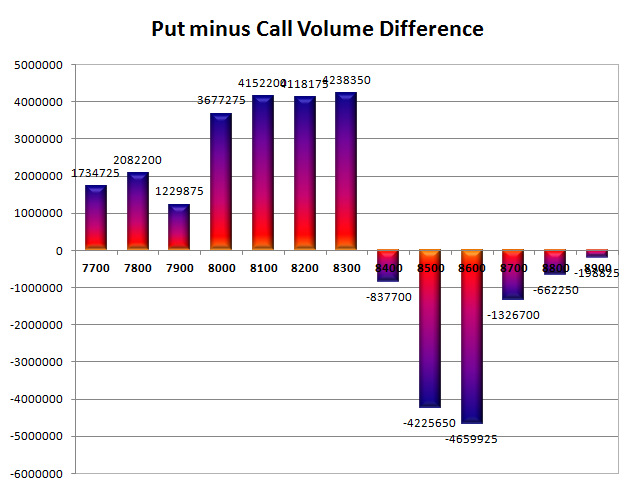 Day Range as per Option Table is 8303 - 8419 and as per VIX is 8297 - 8418 with 8362 as the Pivot.